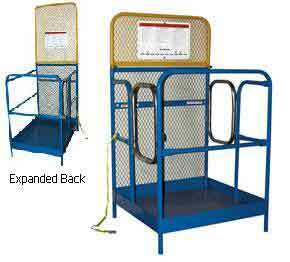 Work Safety Fork Lift Platforms & Fork Truck Extensions Made In The USA. 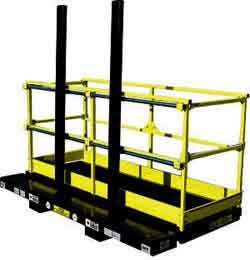 A forklift platform attaches to a fork truck and elevates personnel and materials. There are many occasions that require workers to be elevated in this manner, and forklift platforms provide a safe, compact, and economical alternative to larger equipment such as man lifts and freight elevators. Forklift work platforms are used both indoors and outdoors for a variety of tasks, many of which can only be accessed with a smaller platform designed to fit into hard-to-reach places. Companies routinely employ them for inventory management, any number of equipment repair operations, lighting and electrical maintenance, and building repair. Regardless of the type of forklift platform you use for your application, there are certain essential attributes you should look in any potential purchase. Your platform should be strong enough to support workers and equipment without buckling or bowing in the middle. It must also provide one or more means of enclosure to prevent workers who may inadvertently trip from falling off the platform. Forklift platforms designed with skid-proof decks and toe guards provide additional protective measures, and Easy Rack strongly recommends you invest a little extra in models that screen workers from forklift masts. Currently we have three major lines of forklift platforms from which you can choose. These lines are designed to be highly maneuverable and access difficult places with minimal risk of injury. These platforms will fit any standard or industrial sized forklift and can pass through an opening as narrow as 3’. The platform can be accessed by a variety of fork sizes ranging up to 6” wide by 2 2/4” thick. The platform is secured by a positive pin locking system that holds it in place, and workers are shielded from the forklift mast by a safety protection screen that extends vertically from the base of the platform and prevents workers from coming into contact with the mast. Full perimeter rails provide a safe enclosure in which to work. Workers access the unit through the middle rail in the front, which locks in place once the crew is aboard. This is much safer than a gate that can swing open in mid-air. These forklift attachments are intended to reach over obstacles that normally require a boom to access. Much smaller, more economical, and faster than scaffolds, they are ideal for jobs that require safe, quick elevation of workers to places that are unsafe to climb to. These platforms are maximized for worker safety because they are built with skid proof decking that minimizes the risk of slippage. Full perimeter guard rails feature toe guards and tie offs for lanyards. This platform separates worker space from material space by creating a smaller, but very sturdy, platform for materials. They are optimized for outdoor use on construction sites and rough terrain. Supported by adjustable vertical supports, this materials platform is rated as 600 pounds capacity. Workers stay inside the safe perimeter of the guardrails, which also feature toe guards and lanyard tie offs for additional safety measures. 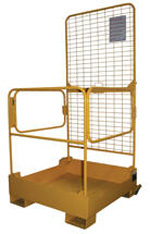 To make the unit super safe, your material handling specialist can also have it custom built with mast protection. Skid proof decking, easy and safe access to tools, and skid-free work space make this the most robust attachment for multi-application use both indoors and out. Easy Rack carries a wide variety of new & used pallet racks, material handling equipment, used pallet racks, and modular buildings installed nationwide. If you can not find what you are looking for call us toll free at 1-888-776-3720 and we will find it for you. Our home office is located in Houston, Texas with regional distribution centers located in all 50 States including New York NY, Los Angeles CA, Miami, FL. Chicago, IL. Denver CO., Dallas TX, San Antonio, TX, Austin, TX, Boise ID, Atlanta GA, Albuquerque NM, Raleigh-Durham NC, Washington DC, Albuquerque NM, Huntsville AL, Fayetteville AR, Norfolk VA & Madison WI.